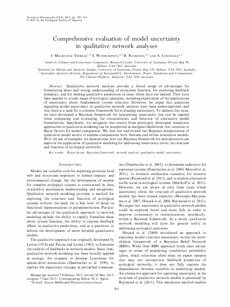 Qualitative network analyses provide a broad range of advantages for formulating ideas and testing understanding of ecosystem function, for exploring feedback dynamics, and for making qualitative predictions in cases where data are limited. They have been applied to a wide range of ecological questions, including exploration of the implications of uncertainty about fundamental system structure. However, we argue that questions regarding model uncertainty in qualitative network analyses have been under-explored, and that there is a need for a coherent framework for evaluating uncertainty. To address this issue, we have developed a Bayesian framework for interpreting uncertainty that can be applied when comparing and evaluating the characteristics and behavior of alternative model formulations. Specifically, we recognize that results from previously developed simulation approaches to qualitative modeling can be interpreted as marginal likelihoods that translate to Bayes factors for model comparison. We then test and extend our Bayesian interpretation of qualitative model results to address comparisons both between and within alternative models. With the use of examples, we demonstrate how our Bayesian framework for interpretation can improve the application of qualitative modeling for addressing uncertainty about the structure and function of ecological networks.